KSRealityBites: Fish oil may cure Leukaemia! Fish oil may cure Leukaemia! 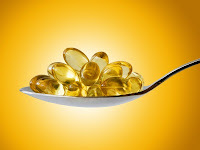 Fish oil may cure Leukaemia! A fish oil compound that targets leukaemia stem cells also holds the key to its cure. Leukaemia refers to cancer of the blood or bone marrow 'which produces blood cells', resulting in abnormal production of leukocytes 'white blood cells'. Sandeep Prabhu, associate professor of molecular toxicology at the Penn State University said, "The D12-PGJ3 compound targeted & killed stem cells of a particular class of leukaemia, CML, in mice." According to a university statement, Prabhu said, "D12-PGJ3 is produced from Eicosapentaenoic acid, an Omega-3 fatty acid found in fish & fish oil. The journal Blood reports that some of leukaemia symptoms are poor blood clotting, impaired immune system, anaemia besides nausea, fever, night sweats, chills, flu-like symptoms & tiredness. The researchers said that the compound kills cancer-causing stem cells in the mice's spleen & bone marrow. Specifically, it activates a gene p53 in the leukaemia stem cell that programs the cell's own death. Prabhu said, "p53 is a tumor suppressor gene that regulates the response to DNA damage & maintains genomic stability. Killing the stem cells in leukaemia, a cancer of the white blood cells, is important because stem cells can divide & produce more cancer cells. as well as create more stem cells.